Easily capture emails in the right place with the right tags for collaboration, compliance & records management! 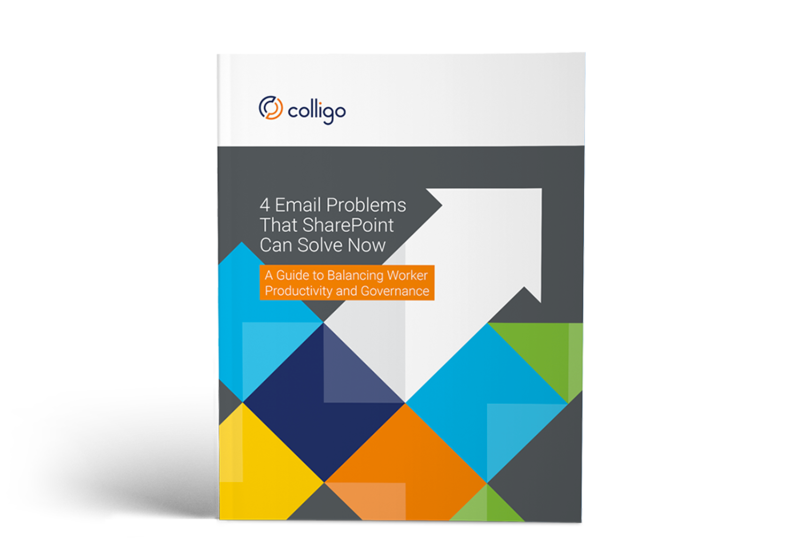 How to solve 4 serious email problems organizations face with email records and information management. A 9 MB project document was attached to an email and sent to 5 employees, creating issues with version control and bloating inboxes. Productivity and collaboration suffer. An important email received 2 months ago is not shared with a new team member who needs to get up to speed. Crucial information in email is lost within multiple inboxes. A consultant, checking his iPhone at Starbucks, receives an email approval from a client. He cannot save the email with the revised document to SharePoint. A smoking-gun email is “lost” in an archived PST file and won’t be found in 3 months during eDiscovery for a court case. This non-compliance results in legal sanctions. We wanted to take advantage of our existing investment in SharePoint. We felt that the familiar, easy-to-use tools that SharePoint and Colligo provided would be readily accepted by users. We had very positive feedback. SharePoint content types and the Colligo metadata capabilities make records management compliance transparent to users."